INSTANT ANTAGONISTS are systemless creatures or beings designed for use in existing modern supernatural/horror games. Many will be supernatural in nature; some will be (at least nominally) human. While one antagonist may be truly evil, others are simply selfish, immoral or may even be victims themselves. Looking for a new twist on an old legend or trope? This product is a perfect addition to a GM's modern horror game collection. 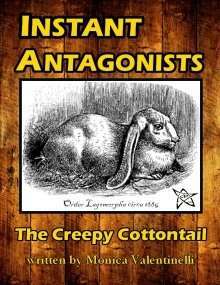 The INSTANT ANTAGONISTS line offers details on each monster's origins, powers and plenty of story hooks to include them in your campaign or evening's session. At first glance, Queenie looks like any other cottontail -- but is he? Come a little closer and see for yourself why this nefarious hare has cultists (and non-cultists alike) running around in circles. Is an Outer God really trapped inside the body of a fluffy bunny rabbit? Will he enslave the minds of pet store owners everywhere? Or will The Creepy Cottontail entice a small town's population to turn on each other in a bloody fight to the finish? Written by Monica Valentinelli. Edited by Matt M McElroy. This title was added to our catalog on July 11, 2011.